I'm not sure, but I think the Davis Baking Co. is where my mother would get Moravian sheet cakes when I was very young. I won't swear to it, but I'm pretty sure we used to go in there for something sweet. Every time I see that building, it triggers some very deep memory of a big, airy interior filled with industrial baking equipment, a glass case as a counter at the front, and being excited about getting something sweet. I was 6 when we left Durham, which is why I don't have clear memories of it. My family used to get dinner rolls every Sunday from Davis Bakery for years. Until we got a stale dozen, we slowed down our patronage. The birthday cakes and donuts were always the best. The current occupant is actually a bakery (Panaderia La Favorita), so it's still being used for its longtime purpose. Davis Baking Co. was still operating when i moved to Durham in 1993, and probably as late as 1995.
by the way, i disagree that widening roads doesn't lead to faster traffic. i think it does, ad a trip up Guess Rd from Carver to Horton will confirm. the question is whether having traffic moving at those speeds is beneficial. While there are air quality concerns that can be met by reducing congestion, the other losses to neighborhood character and overall safety outweigh these. There are other ways to reduce pollution besides increasing throughput and reducing wait times at traffic lights. The panaderia also had for a time a juke joint or pool hall, on the side were all th windows are. It is also a tienda, a crappy one, the panaderia is not bad. 'Branching Out' was in business there in the late 90s early 00s for a couple of years as far as I remember. I always thought they got their stock from the magnificent Thriftworld, gussied it up a bit with fancy displays, and marked it up about 10,000%. But the owners did appreciate the building's aesthetic. When I was little we always got our birthday cakes from there and my mom would always buy a box of the angel food squares for us to snack on before our party...then as I grew up and had kids I did the same, I wish they were still open, I crave those angel food squares to this day!!!!!!!!!! Oh Man!! Those Angel Food Squares!! That just triggered such a clear vivid memory for me! Those things were the best - I've tried others (left NC in 1980 for NY) and STILL can't find anything as good as those! I miss Durham sometimes, thanks for the pics and reminding me of those delicious treats!! I grew up in the Duke Forest neighborhood in the '70s and my brother and I would bike to the Lakewood Shopping Center to watch the matinees at the Center Theatre. We would stop to look at the display cases in the Davis Baking Co. and they always had tons of delicious looking and creative sweets to look at. Our Mom took us there sometimes and we were sometimes lucky enough to get some of the cookies or cakes, or doughnuts. Great smells, sights, and memories from that building. Does anyone know where we can get some of those delicious Angel food squares? I grew up in the Lakewood area. We went to school where the YMCA is today. It caved in during a snow storm and we were sent to E.K. Powe while they built the new Lakewood School. We attended Lakewood Baptist Church. My parents found out I was tithing to Davis Baking Co on Sundays. The Davis family lived on Prince Street. Long Johns, Bismarks and Butter Rolls were the favorites at our house. Pickett's store was beside the fire station, where Grayson's is today. I grew up in Durham and loved Davis Baking Co....especially their angel food cake squares. My own two children grew up enjoying those squares each birthday and other special occasions. I have tried many times to duplicate those sweet treats but have failed each time. I so wish some family member of the Davis clan would share that recipe with all of us who remember the bakery with such fond memories. My friend and I were just talking about Davis Baking company yesterday and those Wonderful Angel food squares !!!! If anyone knows another bakery that makes them or the recipe for those, we would love to know it. 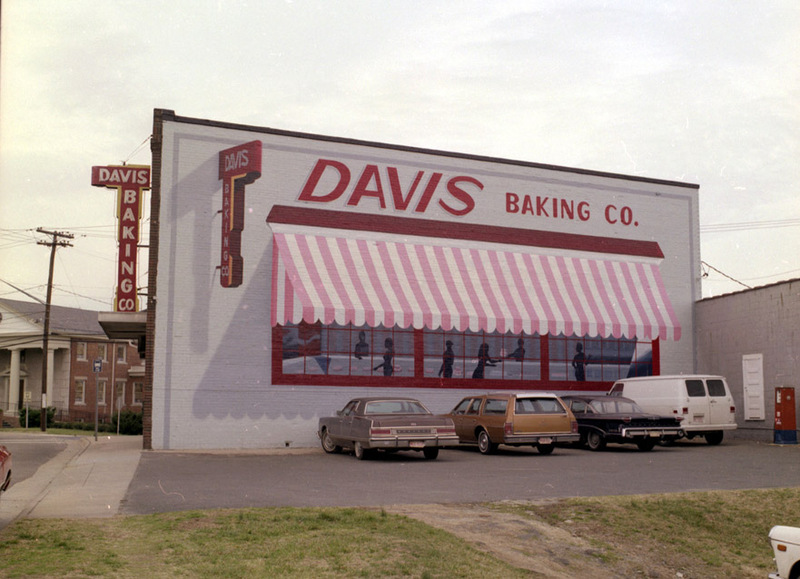 I used to live right by the davis Baking Co. I would walk to school in the mornings, the air filled with the smell of baking breads. What wonderful sweets they had. For me it the jelly doughnuts, bismarks, and the best rum cake i've ever had. I have very fond memories of the place. Memories...My name is James P. Davis IV. I'm te Great Grand son of James P. Davis Sr., also known to many Durhamites as Poppa. My father, uncle and myself closed her down in 96'. As for the A' Squares,cakes, Long Johns, cookies and so on, my father and I as far as know are the only ones that have the original recipies. If my memory is correct, my great grand father and his brother started the company sometime around 34'-36' as a whole food distribution. Then sometime around the mid 60's or 70's they opened up the front to the pblic. Not to sure about the history folks, sorry. The running joke with my grand mother and myself is that on the day of my birth 3/2/78 they brought in the new registe, which oddly enough was from a company named JAY. Which of course is my nickname. Sure ain't easy going by there anymore, with what the memories I have. over half my life up to this point was spent there. I must say to the family that runs it now.....thank you for keeping our sign up. I've been living in Vegas for two years now working as a chef/cook/baker. If it wsn't for the rusty old war horse, so to speak I don't think I'd have the passion for food nor the work ethics I hav. Who knows my fellow Durhamites, maybe one dy I'll dust off the old recipes and start her up again. if not there then somewhere else. but certainly in Durham. Mr. Davis, I'm just so glad someone has the recipes from Davis Baking Co., especially the recipe for those delicious cake squares. My Daughter to this day still dreams of those cake squares and I have searched and experimented through the years trying to come up with something similar...all to no avail. If you ever do decide to use those recipes to open another Davis Baking Co. we both will certainly be customers. But you'll have to do so sooner than later since none of us are getting any younger. Thanks for sharing! I too grew up on angel food sheet cakes and squares (It wasn't a birthday without those sheet cakes!) and delicious jelly donuts that melt in your mouth. I would love to have the recipes for these. Are you willing to share them? I would be eternally grateful. I'm also interested in opening a bakery and I would love to chat with you. Please contact me. I lived on Cornwallis Road, and my father would do our grocery shopping in Lakewood Shopping Center. I vaguely remember the Woolworth's, as well. My mother took me to see Star Wars in the Center theater (I wasn't a year old, and I remember it!). But what I remember the most about Lakewood was the Davis Baking Co. I think we'd get birthday cakes there, and I too remember the Angel Food Suares, dinner rolls, and longjohns. We moved in 1984 off of Garrett Road, but sometimes we would still go to Lakewood. It is good to know that those wonderful recipes are still around! My mother-in-law actually worked at Davis Baking Company for about 50 yrs. She was the tiny little lady, with lots of gray/white/silver hair styled in an "up-do". She started working shortly after they opened (?1930's)and worked there until they closed (1990's). I can remember picking her up from work, and she smelled so good, you just wanted to lean over and "take a bite"! I have many fond memories of that place, including that my wedding cake was made there, and decorated by her. Please share your recipes or sell them to someone already doing business in the area so people can once again enjoy your wonderful squares and other sweets. Anonymous, I think we were in school together! I lived on Perkins, and was in the 2nd grade when the roof caved in. (I also went to Powe) When I was at Carr Jr Hi, we would ride the bus to Davis BC, get a long john, and walk the rest of the way home. I remember the angel food squares, and we always got birthday cakes there, too. My best friend, Tula, would always have those Christmas cakes every year- I couldn't wait to eat Christmas lunch with them! I would love to have one of their angel food cake squares right now! Please Mr. Davis, open up a store and make them again! Durhamites and others would definitely support your endeavors! James, I hope you still check this from time to time. My name is Annie Davis and my father is William D Davis, James P Davis, Sr.'s nephew. I would love to get the chance to email you if possible.If you could email me: annie.davis82@gmail.com I showed my dad the blog and memories started coming back to him. He still has a carousel that was on his 1st birthday cake that he got from the Bakery from Uncle James. Loving all the memories!! James, I hope you still look at this. My name is Annie Davis and my father is William D Davis, James P. Davis, Sr's nephew. I would love talk with you or email you if possible....if you could, please get in touch with me...would love to learn more about the family business. annie.davis82@gmail.com Thank you so much and it's great to see so many memories!! Re: Angel Food Squares - didn't they have almond flavoring? My Brother and I grew up with Davis Baking sweets and my two children grew up with them also, especially those delicious Angel Food Squares which both my Children always wanted for their birthdays. Since Davis has closed I have tried many, many times to duplicate that recipe and have not been able to, much to the distress of my Children. I'm pretty sure they included almond extract but other than that I have no clue. Sure miss them! https://www.facebook.com/#!/pages/Nonas-Bakery-and-Boutique/131566563582991 this lady worked their and makes the angel food cake squares. also if she can get the money for a fryer she will do the longjohns. she is in creedmoor nc. My family owned Davis Baking Company, and my dad, aunts, uncles, and cousins worked there. I was so sad when we closed, but I am so happy to see all of the positive comments. I've seen a lot of comments directed to Mr. Davis about re-opening, but my great grandpa, who originally opened the bakery, is no longer with us, and his son (my grandpa) is long since retired. He's not a big internet guy, but I will definitely tell him to check out this blog! If we were good in church, our mom would drive by Davis Bakery to let us pick something out. I particularly loved the Longjohns but remember the jelly donuts and were there lemon squares, too? Now I live in NY, but visit Durham frequently. Loved the smell of Davis Bakery and can conjure it up in my mind right now! Great to see these pictures! I just wanted to add that, prior to the trompe l'oeil mural, there was a mural of a huge wedding cake on the side of the building. I loved that mural growing up, and (perhaps inspired in part by that), I eventually began decorating cakes myself. For some reason we didn't frequent the bakery very much when I was growing up, though I know I convinced my mom to buy me treats there a couple of times. It definitely felt like "Old Durham," even back in the '70s. I, too, remember well Davis Baking Co. for the long johns and angel food squares. I recently heard there is a woman (who had worked at the bakery) in Creedmoor who has a bakery and makes some of the delicious items we remember from Davis Baking Co. I have yet to go, but will in the next couple weeks. We're not in Cuba or Mexico. Why can't we just say it's a store. Do we have to give up our language along with half the buildings in this town. Thank God this one is still here, I wonder how long. I'll be sure to delete all references to "café" on the site as well, since it's Spanish, or French - depending on who you ask. It'll take awhile, since it goes back to at least the 1920s in Durham. (Palace Café, Royal Café, etc.) Would it be that terrible if we added yet another loanword from another language to English? The static view of "our language" isn't supported by history - words come into use and fall into disuse all of the time. But you probably think that's a lot of malarkey. That's silly. No need to get your knickers in a knot over a question. description of the building's use. You didn't say "barberia" or "panaderia" in your description. Sorry, for a moment I forgot you are just about the architechture and the loss thereof. Not really the history and tradition. I can't remember ever hearing anyone say, "I'm going to the tienda, need anything?" Words do come into and out of use of course, like "carpetbagger". I'm annoyed by the "we're not in Cuba or Mexico" / "do we have to give up our language" xenophobia brought on by the simple use of the word "Tienda" - which is what it said in the window of the store when I wrote the above 3 years ago. That overreaction is silly, taking the word as a sure sign of the decline of our Great Tradition of Western Civilization - which is evidently fragile enough to be toppled by the use of the word "Tienda." My point about the café was that stores choose to call themselves whatever they choose to call themselves - I don't make judgments about those names unless they're unintentionally hilarious. I get the feeling that if someone did say "I'm going to the tienda, need anything?," you'd find that particularly threatening. I'm happy to put my knowledge of the history and tradition of Durham up against anyone's. I'd say I do pretty well for a 'carpetbagger' - from New Orleans (?). My mother would find that particularly rich - she never liked to hide her disdain for me going up into "Yankee land," and was fond of saying re: North Carolina - "It even has 'North' in the name." I realize I have been rude and un-Southern. Recent conflicts and words associated with certain cultures clouded my judgement. I shouldn't have allowed that to happen. I appreciate your work here very much. It is to be treasured. Thank you for that gracious reply Jim - apology accepted, and thanks for the appreciation of my work. Have a happy Thanksgiving. Wow. I was just thinking how much I missed the creme filled goodness of those long johns. I would either buy them at Davis Bakery or sometimes from McDonald's Drugstore. I've never seen -- or tasted -- anything quite like them from anywhere else. I found this site while trying to search for the Davis Bakery icing recipe (a vivid childhood memory). Mr. Davis, I am not sure if you ever check the comments posted, but I'd like to suggest you write a book. 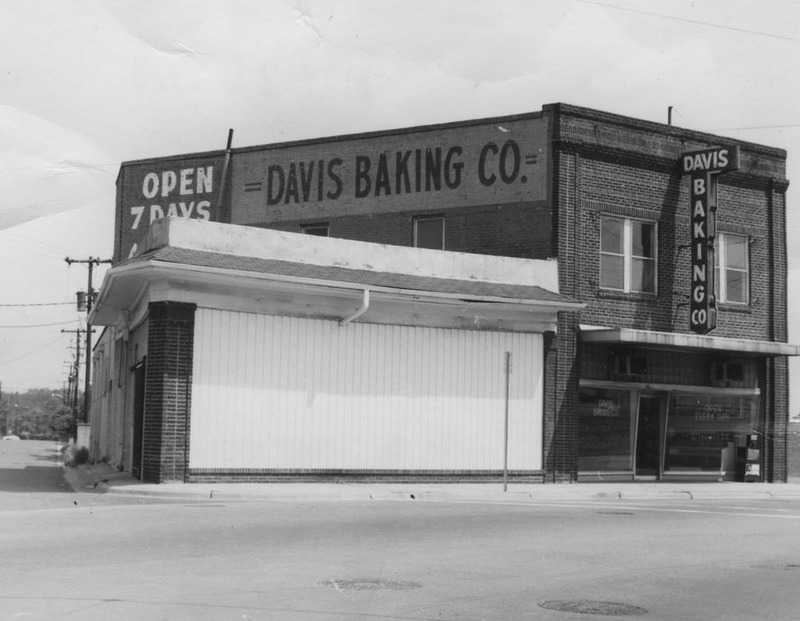 The Davis Baking Company was open so long and during a time of great change... not only could it chronicle the business itself, but it could be used to tell the story of Durham, the south, and small American family business (and include recipes of course). I'd love to write it for you. I grew up on Elmwood Ave, around the corner from the bakery, and my grandfather took me there for a gingerbread man every day after school in the mid 60s. I have very fond memories of the place. I remember the wonderful smells coming out of the back doors, waiting impatiently by the glass cases and being served by an older woman with bright red hair. One of my high school friends worked there in the 70s. And all the paintings on side of the building were a part of my childhood. Thanks to all for the photos and memories. I found this page by accident, but I certainly am glad I did ! I have something I do hope you can help me with ! 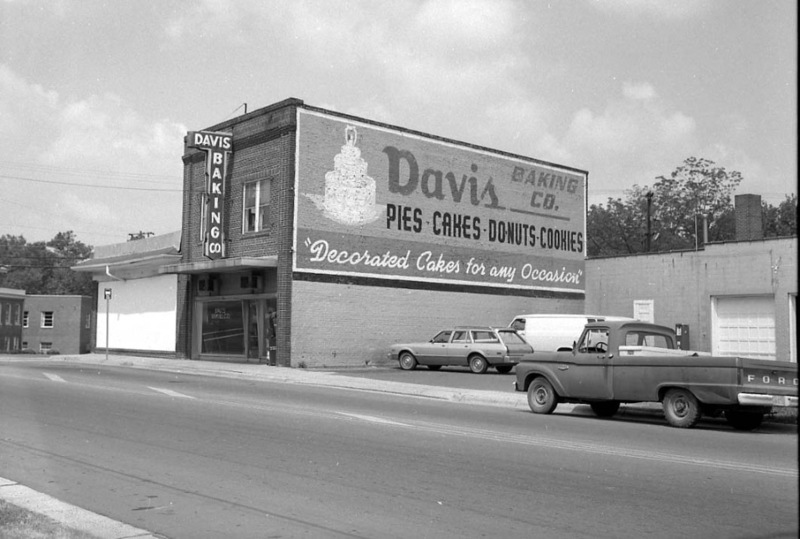 I live here in Durham and I grew up on Davis Birthday Cakes ! I was SO sad when the bakery closed. Every since it did close, I have been on a quest all over the US to try to find the kind of icing that was on the birthday and wedding cakes. I LOVED that icing ! To this day, I have yet to find anybody who makes icing that has even come close ! I myself was in Vegas in March, and went to a well known bakery there to see if they had a similar icing. They did not. Any time I travel I go to bakeries in the area to see if they might have it. None of them have. I would so much love to have some more of that icing. I have tried and tried to make it myself, but I can't do it either. It was so thick but creamy on the inside and yet the outside was a little stiff. I loved the consistency and the taste. Is there any way you might you share the recipe with me, or give me some sort of idea as to how it was made ? I would do anything for one more taste of that wonderful icing ! A lot of people have already commented about the Davis Bakery's donuts, but if you have any other memories or details about their donuts to share I'm doing a project on donuts and I would love to hear them. I grew up on Lakewood Ave. near Morehead Ave. and I would walk to Davis Baking Company on Sat. until I got married to get a Bismark. I would get there early because they went fast. Sometimes I would call and order 6 at a time. I LOVE those things. Even after I got married and had children of my own I would take them to Davis Baking Company and McDonald's Drug store because I wanted my children to have and enjoy those same experiences. I have tried to find anything that could compare, (in several states), but nothing has tasted so good thus far. I wish I had the recipe just for myself and my family. I went to Aunt Ruths as a child and they closed I remember it being only bakery we went to for years then we were told someone from Aunt Ruths worked at Davis Bakery so from there out we went to Davis Bakery. PLEASE I PROMISE it is for personal use and pleasure ONLY! Will sign papers stating so! I too have fond memories of Davis Baking Co.. I had a favorite birthday cake as a child that was a sheet cake decorated to look like a circus, complete with a big top and clowns and dancers. I have aspirations in baking and dream of opening a bakery with the same charm and goodness as that of Davis Baking. There aren't many places around these days the evoke memories the way this place does. Thank you to the Davis family. Mr.Davis,I grew up in Durham and my mother would buy birthday cakes from there and they were so delicious,my grandmother would go by there and by those delicious angel food squares,long johns,jelly filled donuts etc,we just love all the sweets they had there,hope you do come back to Durham NC soon and re-open the Davis Bakery Store. I loved Davis Bakery! My favorite was the large cupcakes, white cake with chocolate frosting. I would go by there and get these cupcake on my way to work and share them with my coworkers. I now live in Charlotte and can never find a cupcake that taste like the ones from Davis Bakery. I really have not been able to find a good cupcake, they are truly missed! When I was a child, my grandmother would take me to Davis Bakery for an iced gingerbread man. They were my favorite treat, and they would decorate them seasonally. I used to take a box of them to school each year on my birthday, giving one to each classmate. I fondly remember their buttery dinner rolls, which were a mainstay at each of our holiday dinner parties. Every holiday I wish I could find a recipe for these! Before the barber shop and Davis Baking, this was a string of grocery stores starting in 1920 followed by a drug store. The original gas station (2024 CH) was called Mc' s Filling Station, and was owned by Eugene T. and Nannie Mc Crary. Dear Mr. Davis- my family also owned a restaurant in Durham (Amos ' Andy.. Remember it?) and am glad to hear u have the recipes. While I would LOVE the recipe for the best sweets I've ever had and remember- I understand u keeping in the family. However :) if u decide to do a book- ill b 1st in line! I went to high school with Sandy Davis. I always remember going by the bakery and getting a couple of dozen of their butter rolls. Had to get 2 dozen so some would make it home. Have never found them elsewhere. Those thing like every thing else there were good. 'guy said...i remember when the durham pd used to site kids for skateboarding in/at the lakewood shopping center construction zone. this was when skateboards were make out of a 2 by 4 & a portion of a steel roller skate. the cops said, "this will go on your permanent record". we used to drag up to davis bakery and drowned our sorrows in snacks. "granny and poppa" davis would tell us not to worry, that everything would be alright and they most times wouldn't even charge us for the baked goods we ate. Interestingly, none of us that ever got "cited" for creating a safety hazard while skateboarding turned out to be serial killers...i think alot of it had to do with granny and poppa davis at the bakery feeding us day old cookies'. 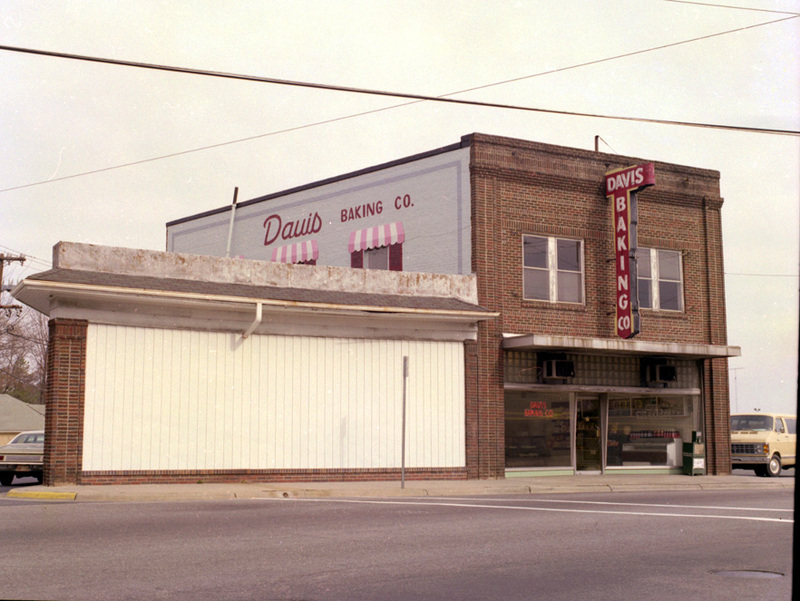 The Davis Baking Company building was originally built in the late 1920s by Cary and Charlie Crutchfield, who operated a dairy in southwest Durham. A gas station was constructed soon thereafter on the corner, and the two-story building was occupied by the Lakewood Barber Shop. In the 1940s, the Davis Baking Company bought the two-story building and the gas station and enclosed the gas station to make a 1-story 'wing' off of the main building. 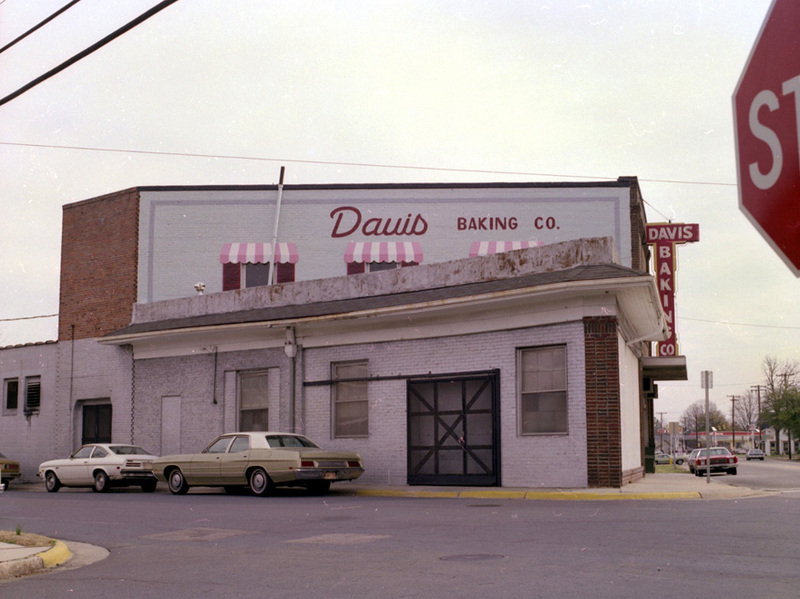 The Davis Baking Company operated here for many years. In 1980, they painted their northern and southern walls with a trompe l'oeil mural which made the north side of the building appear to be another large window and awning to travelers headed southwest on Chapel Hill Road. I'm not sure when the Davis Baking Co. closed up shop - I think it was sometime in the 1990s, but I'm sure someone can correct me. The main building is now occupied by a Tienda, I think. The murals on the sides are quite faded and indistinguishable at this point, but I'm glad the big vertical sign remains out front. But these buildings remain a testament to the power of the right mass of architecture on the right spot. Part of the charm, interest - however you want to define it - of this building results from its position at the curve of Chapel Hill Road, and the way it addresses the road (the angle of the facade, the proportions of the building.) This kind of thinking about site and about buildings - how does it look from two blocks away? - is too often lost in newer development in favor of creating insularity. People may insist that some urban road needs to be widened to some ungodly number of lanes to supposedly bring economic development (false) or speed up traffic (false.) But the natural instinct is then to turn all of the buildings and development away from that ugly road, and place the big asphalt parking lots there. The result looks nothing like the simple beauty of the Davis Baking Co. buildings; but for some reason we can't seem to grasp the value of this in the way that we do big roads and endlessly metastasizing parking lots. In 2017, these buildings were renovated to house a new restaurant, The Lakewood. We're not in Cuba or Mexico.